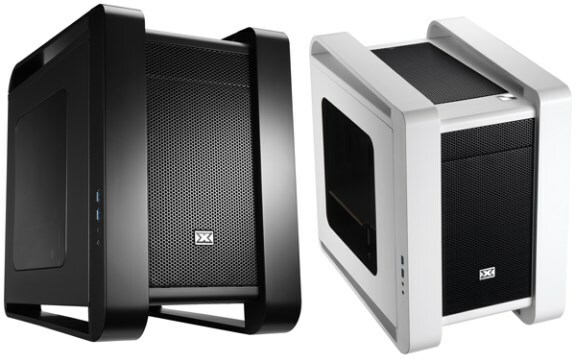 Xigmatek introduce Aquila, a new Micro-ATX case available in black and silver. 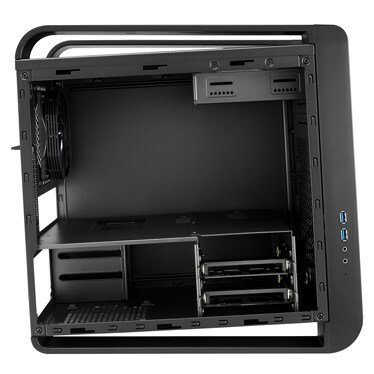 Measuring 390mm x 403mm x 265mm (L x H x W), this case supports Mini-ITX and Micro-ATX motherboards and has room for one 5.25" device, two 2.5/3.5" devices, two 2.5" devices, and 4 PCI cards. There's room for graphic cards of up to 330mm long and you can install up to four fans (one 120mm Xigmatek XOF white fan is included). In 2013 Xigmatek completely redesigned the traditional look of the small form factor chassis and added unbeatable style and performance to something which was so simple looking. Usually for a micro-ATX, mini-ITX chassis the exterior design is straight forward and non eye catching. We wanted to change the industry's perspective on small form factor chassis and build something that everyone can enjoy! The base of the chassis is elevated at the front which provides extra intake airflow. Unlike other micro-ITX chassis he interior can support up to micro-ATX giving you the selection to use SLI or Crossfire in your build, not to mention being able to fit full length top of the range gaming VGA cards. Also a added feature is to use a full ATX power supply instead of a SFX PSU. The handles on the top are not only there for looks, they can support the weight of a full gaming build. We know that recently smaller form factor builds are becoming more popular. With real estate rates rising and room size depleting, we understand it is necessary to cut down on space. Includes pre-installed high performance silent Xigmatek XOF white fan with FCB (Fluid Circulative Bearing) for ultimate exhaust capabilities. Capable of mounting Micro ATX, mini-ITX Motherboards. Innovative 3.5“/2.5” Internal x 2 (tool-free retainers) + 2.5” Internal x 2 (tool-free retainers) . Standard P/S2 ATX/EPS power supply units on downside space with anti-vibration rubber.